This post was sponsored by SimplyBiotix in partnership with the Mom It Forward Influencer Network. All thoughts and opinions are my own. As this is our first year in public school, we have been hit with more than our share of illness. Our sponsor, SimplyBiotix fits into our latest post about Promoting Gut Health in Kids. We know how important it is to have a good supplement routine for our son, and improving gut health is vital. First off, this post is a sponsored post for a probiotics brand, but that doesn’t change how we feel about the use of those in our life. Our thoughts and opinions about the product below are our own. Secondly, as I have worked on my own health over the last few years, I have really learned a lot about gut health and how it can affect our overall health. The tips below are ideal for helping you to improve the overall health of your child. One thing we had gotten kind of lax about this year was taking probiotics every day. It’s hard to remember everything, and when I ran out, I didn’t restock. That was a huge mistake for our family. Having a healthy gastrointestinal system is so important. That means taking probiotics to make sure you have healthy bacteria in your stomach. Probiotics like SimplyBiotix help with not just daily gut health, but all digestive health and immune health. Children can be little germ beakers when they are at school. Having proper immune system support is a must! I received a few products to review from SimplyBiotix. I am listing them below with some of the things you should know about the products. We’ve been trying these in our home and love them! Note: Not all probiotics are created equal. SimplyBiotix is great because they guarantee the survival of good bacteria. 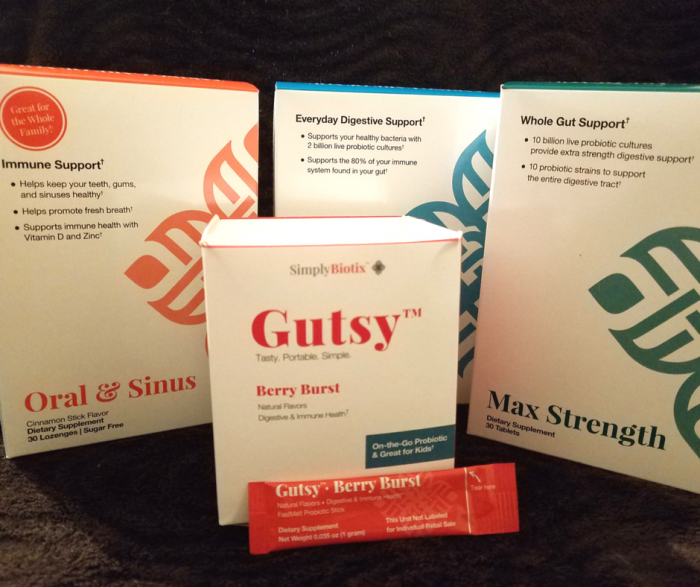 Gutsy: Kid-Friendly, Berry Burst Flavor, fast melting probiotic powder (no need for water), easy on the go dose, supports immune and digestive health. Oral & Sinus: Cinnamon flavored, helps with bad breath, supports ear, nose, and throat health as well as oral and immune health. Helps balance bad bacteria that helps your entire body. Sugar-free and kid-friendly. Gut Health: Supports digestive health and immune health. Developed with BIO-Tract Technology. Has an innovative delivery system that helps good bacteria survive in your gut. Max Strength: Supports digestive and immune health with more cultures and strains. Perfect for those who need extra support. One of those little things that I find extremely important for overall gut health is to avoid all the added sugar. When our son eats too much extra sugar in sweet treats and such, I find he just isn’t as healthy. Something about that really seems to change how his body acts. So, avoiding sugars helps him and his gut to stay healthy. One of the biggest ways you can improve gut health in your children is to teach them to become self aware. This includes little things like being careful about hand washing and eating healthy foods, but also includes the step of acknowledging to you how their digestive system is reacting. As parents, we may forget to ask our older children about their daily bowel movements since we no longer change their diapers, but it is important for them to share with you if things are different. I actually keep a picture of the “poop chart” handy for him to show me if something isn’t normal. This helps you and your child to learn triggers for bowel movement issues. When they notice a change, then you can figure out if it is food or environment related. Things like stress, germs, stomach bugs, and different foods can all change gut health in children. Being self aware helps you as a parent and them as they grow up and have to care for themselves. As you can see, gut health in kids is easy to manage. 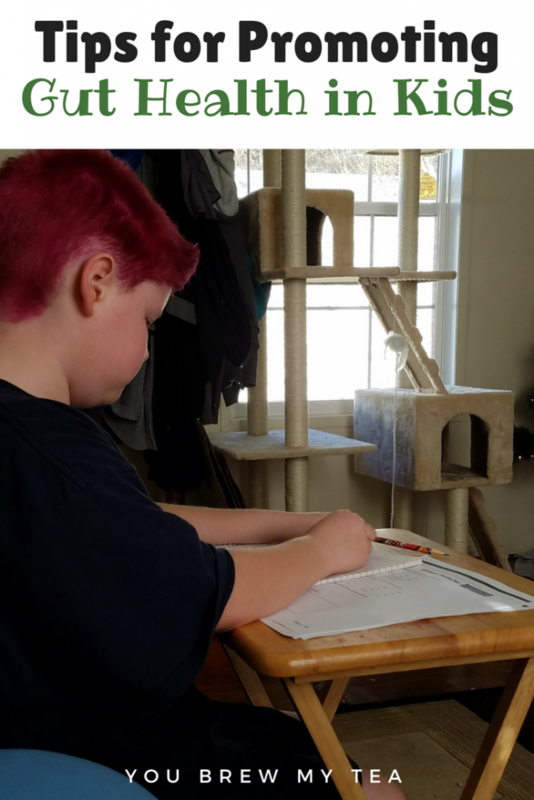 Most children won’t have issues, but you’ll want to add in a few simple steps to make sure no issues arise.